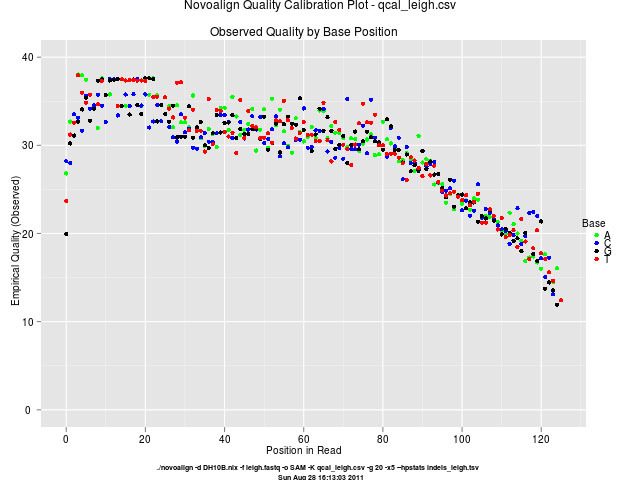 This entry was posted in Ion Torrent Blogs and tagged 100AQ20, 100AQ23, Accuracy, Ion Torrent, MiSeq. Bookmark the permalink. Hi Nick, thanks for the kind comments and feedback. 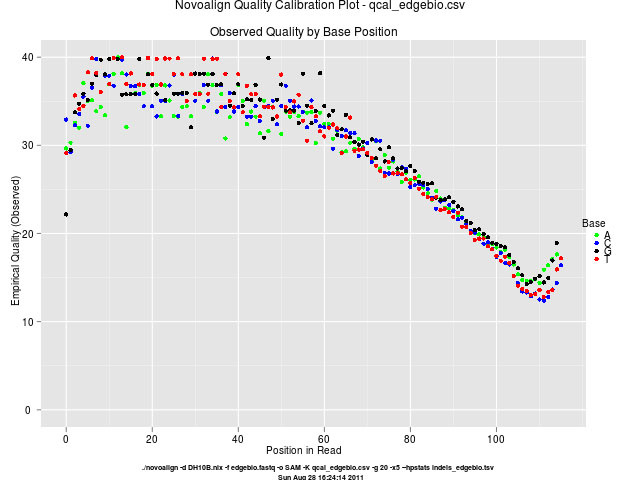 Yeah I noticed that it cuts off at 150 bp, I’m pretty sure that’s a limitation of the -K option on novoalign and not bounding the R plots. I’ll let Novocraft support know to see what we can do. 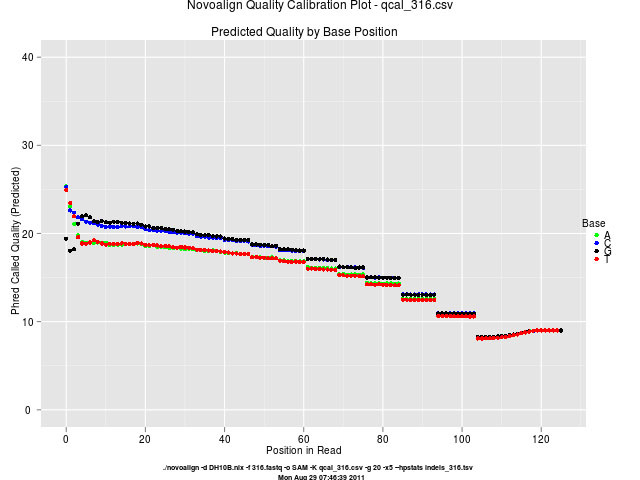 Hi Lek – the work around is to supply “-n 300” to Novoalign; it will truncate reads at 150bp by default. 300 is the maximum length. Nick, thanks for the tip. I ran the analysis again with the -n 300 option and have updated with the new figure. 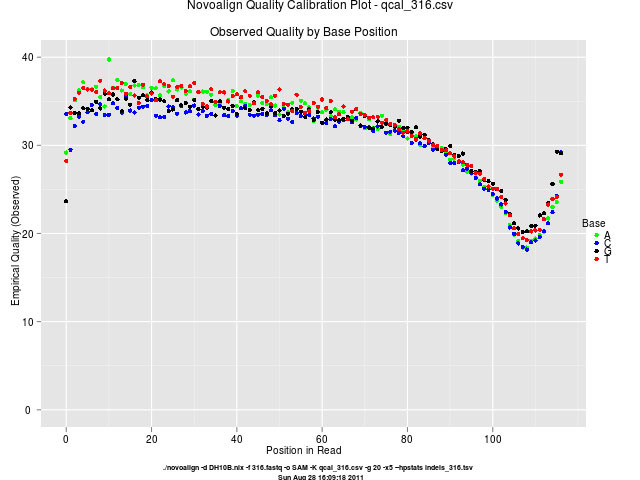 There now appears to be a nucleotide bias after 100 bp with the ‘A’ producing low quality. Any thoughts? Yes, I think there is some artefact appearing here. Need to align those tails and check what it is. 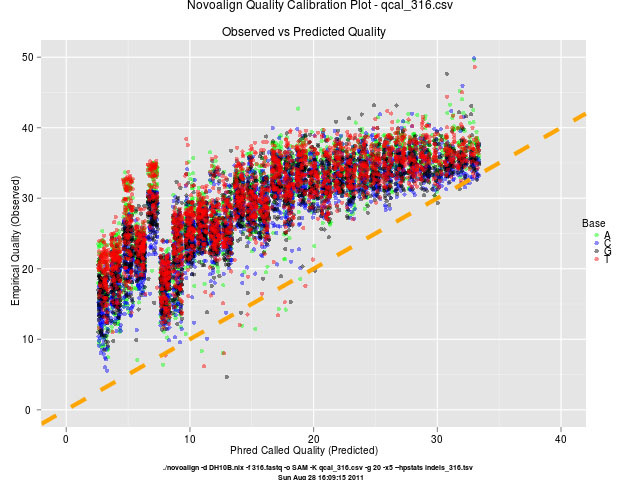 In response to a tweet comment regarding amplicon data. There are two reasons why I can’t analyze amplicons. First, there are no public releases and if there are, they would be too few to compare over time. Second, I would love to show ours but all our projects have been delayed since we have to wait 3-5 weeks for Ion specific consumables, i.e. we have to wait until the “big boys” and “special customers” get their orders first 😥 Democracy? It has always been interesting to see how large companies deal with members of the scientific community, given that companies primarily exist to make money, while people pursue a career in science to uncover new knowledge, but often need to operate like a business with the competition for grants and other funding. Companies that have their own research departments and research groups that enter into the commercial field with the products of their work add a further depth to this as well. From what i have seen so far Life Technologies have been promoting the idea that they are trying to open the field for everyone, with sharing of data and affordable equipment. They also, in my experience, seem to be trying to take the stance of letting the machine and its results do the talking in response to claims by other companies. It will be interesting to see how well this holds up when other companies have their competing platforms availible. I can see why the double standard develops with the “big boys” getting first access to a lot of the resources, they have significantly higher throughputs, leading to larger and more consistant business which is what a company wants, but this can be very frustrating to the rest of us who are significantly invested in our own projects and can see the next big breakthrough just around the corner when we can use that new tool. We’ll just have to wait and see how open and sharing the companies become/remain when the other competing platforms become availible and in use. Maybe there will be free t-shirts to persuade people if there is actually another option they can go and buy now instead of needing to wait for it. Thanks again Andrew for taking the time in writing your opinions as a detailed response. Just to clarify, I’m not saying don’t bother with the “big boys” as they will have the capacity of doing things fast through their infrastructure and expertise. I’m just saying don’t forget about the “little guys” also because they should get a break every now and then. If I had a dollar for every great discovery around the corner… Is that like the great miracle of the human genome sequence ? 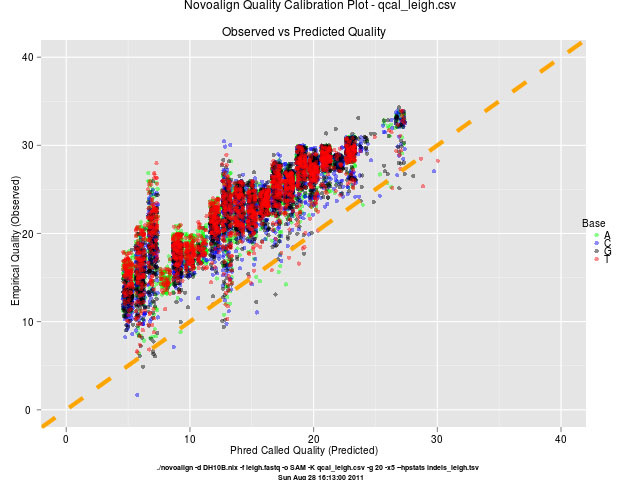 Regarding Ion Torrent and Early Access to new kits… It’s important to remember that when any company gives early access to new kits to “special” customers, the company is trying to see how untested kits work outside of the development environment. It is incredibly difficult for a company to give early access to kits to everyone. That would essentially be launching an untested kit and an irresponsible act by the company. Whether we give it to a big lab or a small lab is just a decision made quickly to find someone willing to test it and give feedback. 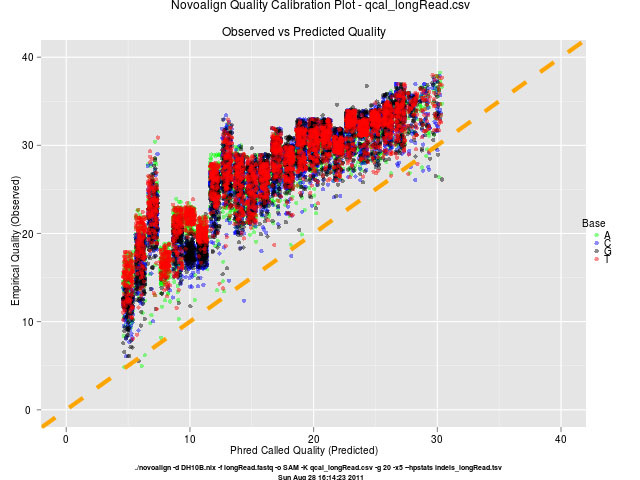 Releasing half tested products to the masses shouldn’t be confused with democratizing sequencing. 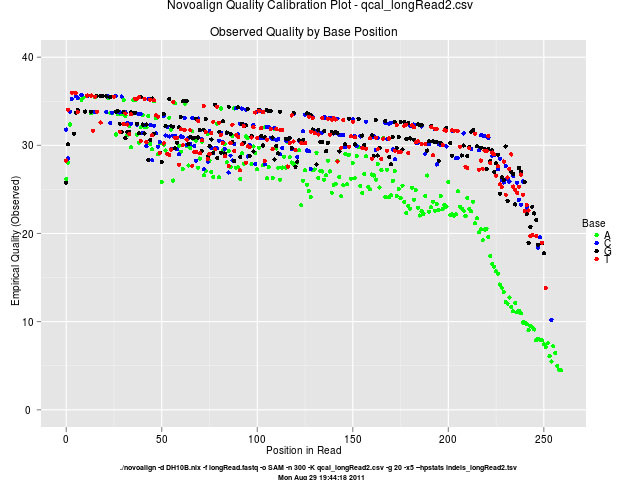 Lowering the costs (both capital and operating) and lowering the technical barrier to results IS democratizing sequencing. Broad release of untested products is just bad business. Thanks for the comprehensive blog. I am not going to thank you for the jokes though 😉 On a seriously and partially related note, I was wondering if you are experiencing any chip failures. In other words, do you know of any cases where the data is useless and it cant be attributed to a prep error? Thanks again. Marko thanks for the comments. Our lab is small so does not go through the chips that fast. I have not read any reports on the Ion Community “PGM Users” section regarding chip failures. There are a few things to note. (1) The PGM runs a chip diagnostic test before the run. 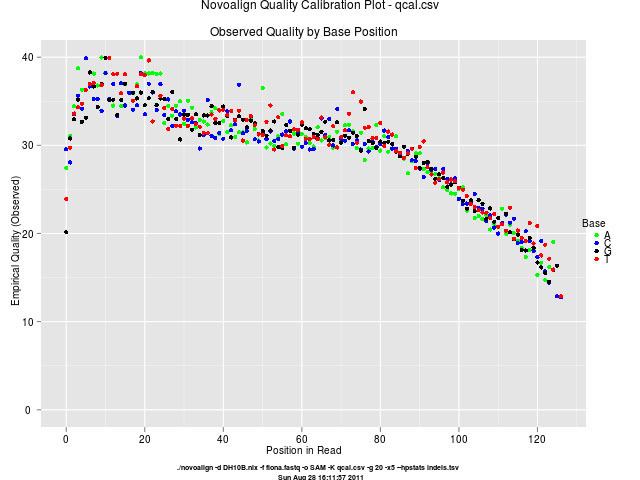 (2) There are wells that are not measuring the signal correctly. The chip as a whole may be okay but there may be some slight imperfections in the wells. But I digress… the answer to your original question is NO. 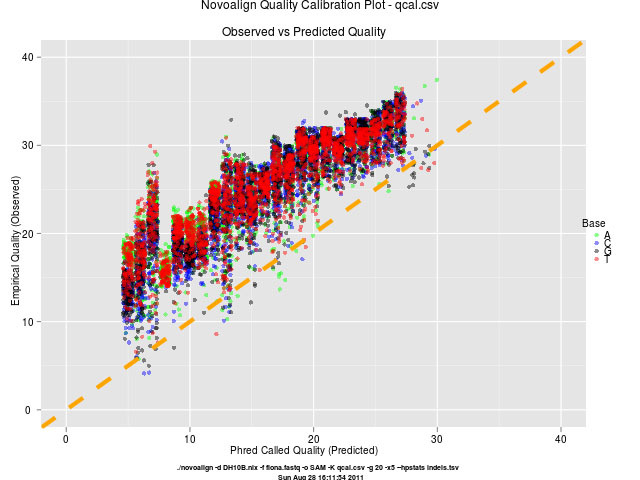 For the “predicted” vs. “actual” accuracy question, the point of predicted accuracy is that many tools use this in their calculations. The more accurate these estimates, the happier those tools are. Of course, you can always go and recalibrate everything , but that’s an extra step one would rather avoid. Keith, thanks for the comments and expert input. 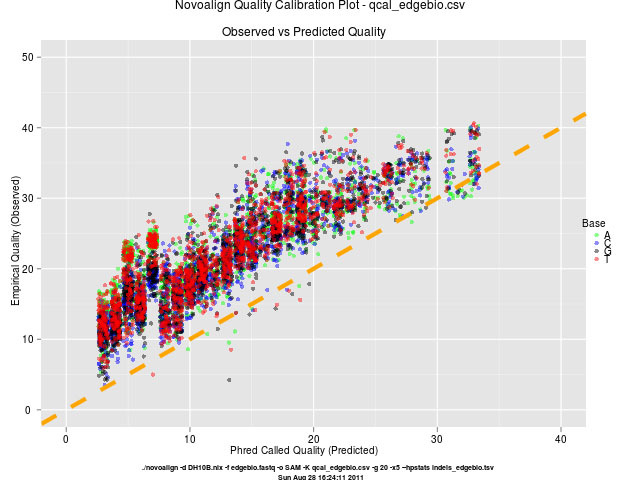 I have updated the section in another blog post where I mention the value of predicted accuracy.